Blue sea, beautiful weather and you, with a full face snorkel mask! Wait! What is the problem? Are you feeling uncomfortable? Can’t you see properly through the mask? No tension. It’s just fog which has deposited into your full face snorkel mask. Yes, maybe it is a very simple thing. But it can create dangerous situation too. You cant defog snorkel mask at that moment .Just think about a situation where you are with the snorkel mask and suddenly your mask get bound to fog. In the water without seeing anything, how can you do everything properly? If any serious matter happens, how can you see it, how can you avoid it without a proper vision? What about a rock? If a rock hits you in that situation, you will have nothing to do underwater. And this is the dangerous part of this simple fact of fogging in the mask. Now, forget all the tension. 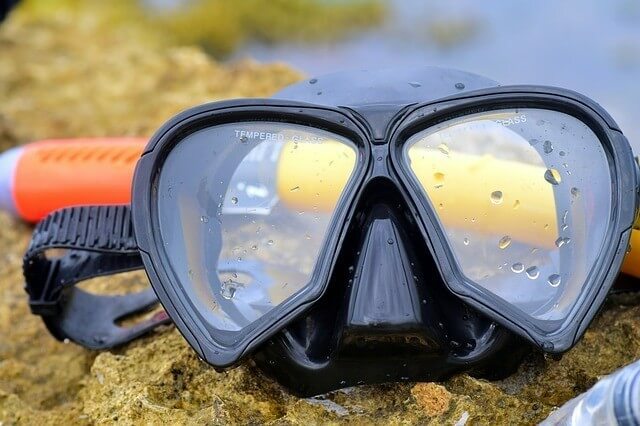 Maybe your snorkel mask doesn’t have the option to keep the fog away, I am here with some tips and effective ways for you which will help you to defog your full face snorkel mask. That is the most normal and natural thing you can do to defog your snorkel mask. If you don’t have any other thing to clear the mask, do spit on the lens of the mask. Then rub it with your thumb. After that, rinse the mask into the water. That’s it! Your mask is ready again. Before using clean the water from the lens. Is toothpaste only for cleaning teeth? Absolutely not! So, if you want to use your toothpaste for doing something more, you can use it to clear your full face snorkel mask’s lens. To do it, at first clear your hands with soap. Do it properly. Otherwise, your snorkel mask can be affected. 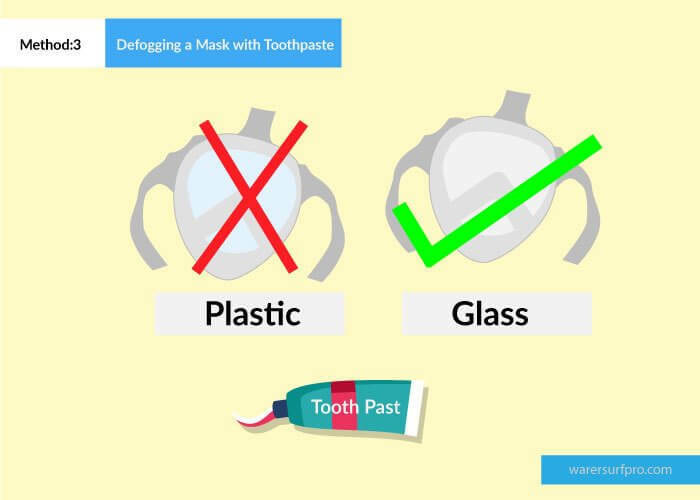 Keep in mind that, if your snorkel mask is of a plastic lens, then you can’t use toothpaste to defog it. Only glass lens can be cleared through toothpaste. Your snorkel mask also should be a dry one. Now, if all these things get matched with your mask then take toothpaste. Then take a little bit toothpaste and rub it on the lens. Then clear it properly with water. Let it dry and use the mask. Before using check it. See whether the mask deposit fog again in its lens. If it doesn’t, then your mask is ready. But, if it does, then do the process again until it doesn’t defog. Sometimes, for the newly bought mask, it needs five times cleaning with toothpaste. 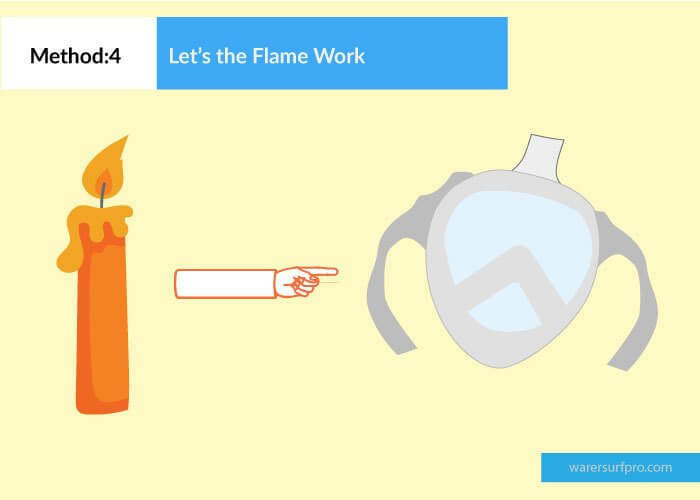 You can even use a flame to defog your mask. For this, you only need a candle or something like- lighter. Lit it and keep it inside of your diving mask. It will turn your mask’s lens into the black. Keep in mind that, the lens should not be too much hot. When the lens will turn black, take the lighter or candle out. Then take a cloth and clear the lens softly. Do the thing again. Yes, I am telling you to repeat the matter. Again clean the lens. Do the same thing again and again till the lens stops being black. After that, your lens will be fully defogged. But, remember that, you can only do that if your lens is of glass. If your mask lens is made of plastic, then you should not use this trick to defog it. Otherwise, it will create more problem. If you look for the best and the product which can be carried easily, it is baby shampoo. You won’t need much time to make it. You won’t need more space to keep it too. 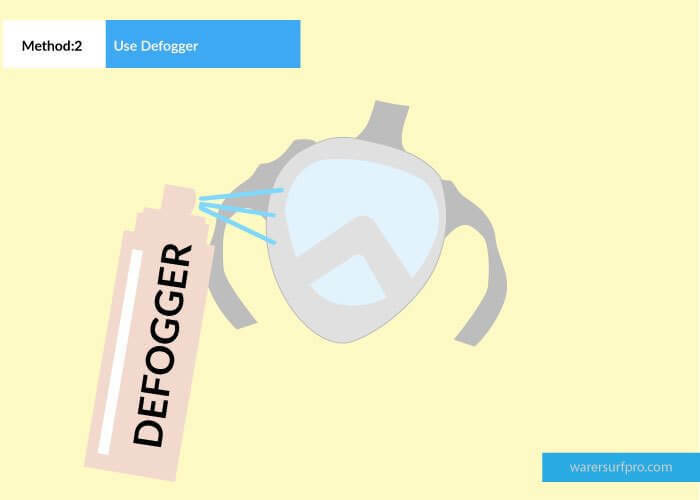 it will give you proper support easily at the right time when you need a defogger for your snorkel mask’s lens. Just take some baby shampoo and mix some water into it. You can put it in a spray can if you want to use it easily. Then, just clear the lens with the shampoo. It will work like a defogger. You may be thinking, why we are not going to other shampoos? 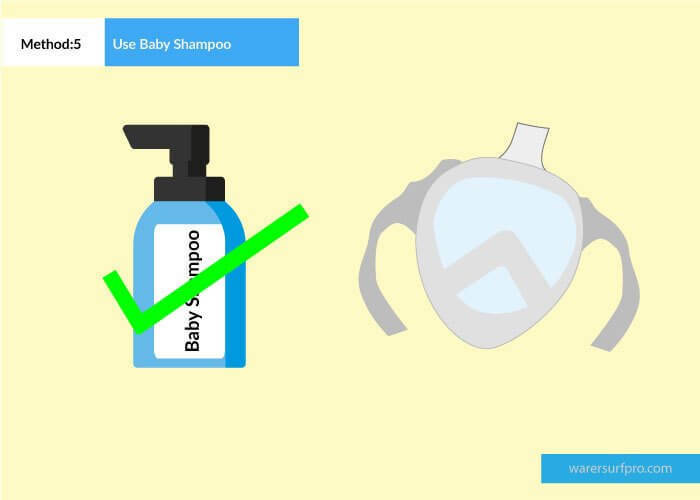 Yes, there are some positive sides of baby shampoo. As you are clearing lens through it, it should be good, shouldn’t it? It is non-allergic, friendly to the eye and biodegradable. Besides, it smells good too. All these things you only will get through baby shampoo only. Potato is very good to eat. It is full of carbohydrate. But, you don’t know that it can be a good defogger too. Want to taste it on your own? Why not! If you have a knife in your home and your kitchen do store some potatoes, take one from them and cut it with the help of a knife. 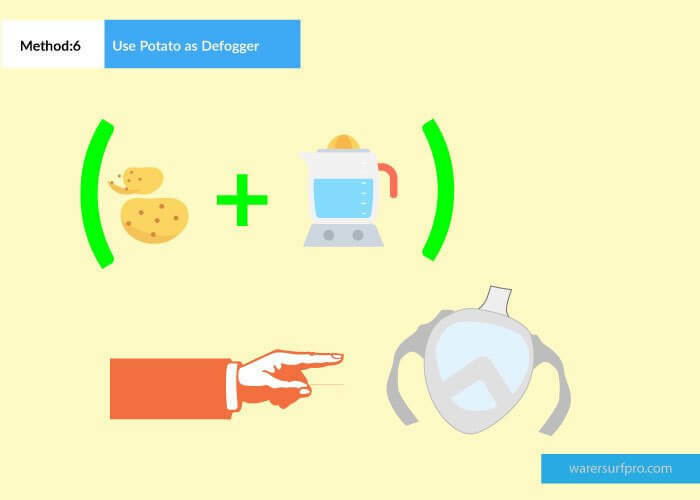 Then rub the potato with its juice on the inner part of the snorkel mask. Now, rinse it with the water and clear it. What more do you have to do? Just go for diving. It may don’t even work too. but don’t be in confusion. let’s taste it and know another use of potato too. Yes, as I said in the bracket, you should follow the instruction too. do you have any other option available near you which I said at this point? If the answer is yes, then go for the other defoggers. Because you will feel some issues with this defogger. Glycerin and detergent is very good at defogging. But it has some lacking too. If your mask leaks or if you think that maybe your mask can leak anytime, don’t use these things. 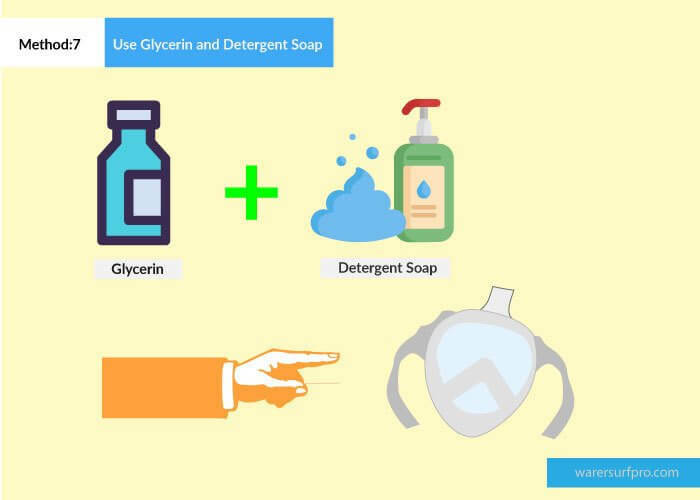 Glycerin and detergent are good at defogging but are also bad for eyes. If it mixes up with water through leaking the mask, it can do harm to your eyes. Besides, these things are not biodegradable at some time. This may cause water pollution. We should not use anything in the water which is not biodegradable. Still, do you want to use it on your mask? Don’t you have any other options in your hand? Ok! Then go for it. But make it sure that, your full face snorkel mask doesn’t leak. As I said before that, you should not use your hand to defog snorkel mask without cleaning it properly. For cleaning, even you can use a toothbrush. It will help you not to touch it with your hands. So, don’t even try to touch the inner lens without any necessity. It can make the situation worse. Defog the mask is not an occasional matter. You should do it frequently. You need to defog your mask every time you will go for snorkeling. For this using baby shampoo in a spray can or buying any anti defogger spray from the market will be perfect. It is a dry mask. So, use it on dry face, keep it dry. Don’t open it under water. Then it will get wet and that will become a disaster. Don’t try to clean it from inside. If it becomes hard to see then take it off and use the easiest way- spitting. Anymore problem? Let me know what it is! You know, every problem has solutions too!